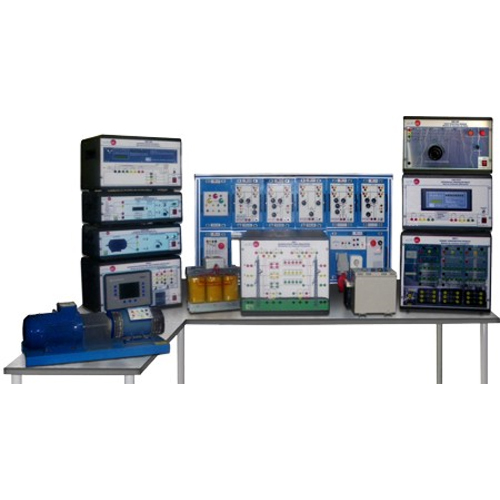 The “MPSS” is a modular Power System Simulator specially designed for Technicians at Technical and Vocational level. 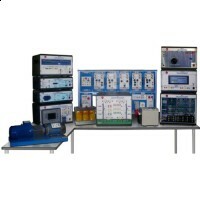 Manual operation or in combination with SCADA system. All the main protection relays involved. BUS03. Busbar model 3 (Coupling). BUS04. Busbar model 4 (Consumption). VVCA/MP. AC Motors Speed Controller. AE1. Transmission Lines Simulation Unit. ERP-PGC. Generators Protection and Control Device Unit. ERP-PD. Distance Protection Relay Unit. BUS01. Busbar model 1 (Generation). ERP-PDF. Differential Protection Relay Unit. BUS02. Busbar model 2 (Transport). BUS05. Busbar model 5 (Transport). One three-phase power supply output connector. One three-phase power supply output with red, yellow and green connectors. Two single-phase power supply output. One single-phase standard type power supply output. A removable key 6 with two positions (ON and OFF) acts as main switch. 1.One three-phase AC squirrel cage induction motor acting as generation prime mover. 2.One three-phase Synchronous generator with DC field excitation. The induction motor is controlled from the VVCA/MP. AC Motors Speed Controller.